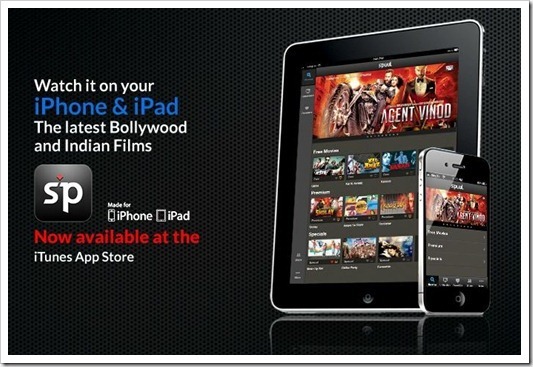 Spuul’s new iOS app offers free Bollywood movies, TV Shows! Singapore based start-up Spuul recently launched its own iPhone / iPad / iPod Touch app allowing users to watch Bollywood movies, TV shows and other streaming content online. Spuul.com and its iOS apps are based on the freemium model where users can get free access to online content supported with advertisement. The platform also offers paid/premium services. Users can create an account on Spuul by simply signing in with their Facebook accounts. The price of watching a movie on Spuul also depends on the type of movie and the type of pricing plan that users pick. Under the Forever Free plan, users can watch all movies categorized as Free which will be supported by advertisements. Spuul.com’s premium plan allows users to access all movies categorized as Free and Premium. This plan will set users back $4.99, translating approximately to an affordable Rs. 275 per month in India. For Indian users, this is maybe just less than the price of two movie tickets in a big city multiplex. Spuul also features content tagged as Special which can be accessed via a one-off payment of $0.99 or approximately Rs. 55. Content tagged as Premium and Special will also have advertisements. Spuul.com and its app feature a range of new and old Bollywood movies. The current list of Bollywood movies which can be accessed online or via its iOS based app include recent flicks like Ra.One, Zindagi Na Milegi Dobara, Agent Vinod and more. Even old Bollywood movies like Karz (1982), Chitchor (1976) and Bombay to Goa (1972) to name a few can be found. Indians living abroad are known to turn to online sources to watch their favourite TV shows and movies. There are many legal and not-so-legal websites catering to the home-hungry NRI. Spuul’s premium subscription fee of $4.99 per month for unlimited access isn’t bad at all for NRIs and even for Indian audiences who would love to cosy up in the comfort of their own homes and watch Bollywood flicks. Besides the monthly membership, surely a movie-night at home with friends powered by a Rs. 55 Special from Spuul sounds pocket friendly. Co-founded by Sudesh Iyer, the founder of Sony Entertainment TV in India, Spuul is a fab concept but it will need to bring in more titles to attract and pacify the movie hungry desi. If you own a iPad, iPhone or an iPod, do give spuul app a spin and let us know what you think about it! Reliance 3G plan prices slashed by 90%! it's a really good app, but the problem with it is that it has no English subtitle. Not everybody knows how to speak Hindi, and I'm one of them. Streaming video and content is already a hit across many cities of world but in coming times it may bloom all over the world. This can be a good for Indians living abroad as they are always eager to catch up with their favorite Indian shows as well as Indian movies.